We are proud to announce that Cutis Medical Laser Clinics provides Certified CoolSculpting Practice Singapore. We have undergone a comprehensive training and certification program for achieving optimum results for the CoolSculpting procedure. 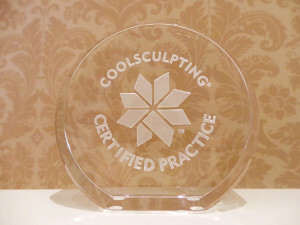 CoolSculpting is a technique dependent procedure and the certification ensures that each patient will receive the optimal treatment. CoolSculpting by ZELTIQ is the original non invasive, US FDA-approved fat removal treatment that uses safe and advanced fat freezing technology (Cryolipolysis™). CoolSculpting technology uses controlled cooling (Cryolipolysis™) to target and kill only fat cells without damaging the skin or other tissues. In the weeks to follow, these fat cells are naturally metabolized and eliminated from the body. CoolSculpting results are long-term, as the treated fat cells are gone for good. CoolSculpting can treat stubborn fats belly, back, arms, and thighs that are resistant to diet and exercise. The CoolSculpting procedure also has a lot of unsafe copies and imitators which are not proven for safety and effectiveness. Make sure to ask for the original COOLSCULPTING by name and consult a Certified CoolSculpting Practice in Singapore. Watch our video to see how CoolSculpting works.